How and why does a company as large as Nokia restructure so often? Is it in response to a dynamic business environment? Or is restructuring a tool for growth? What traits of Nokia make for such smooth transitions and is collaboration the way forward? A look at Nokia's recent history reveals how organisational restructuring can be used to handle a dynamic external and internal environment. It is an example of theory in action and how it helped Nokia adapt to a changing environment and prepare for the future. Nokia was established in 1865 as a pulp and paper mill in Finland. During the 1960s, they expanded into the rubber and cable industries through a series of mergers. In 1975, they expanded into many industries such as computers, consumer electronics, and cell phones. In 1979, Nokia and Mobria entered into a joint venture, which Nokia took over later to design and manufacture mobile phones1 . Since 1998, Nokia has been the market leader in the mobile phone industry transcending the boundaries between countries and continents. Nokia has diversified its business model time and again to maintain its leadership status in the industry. To achieve growth and success, Nokia had to go through a number of corporate restructurings to revive the organisation and adapt to its dynamically changing goals and visions. Restructuring allowed Nokia to come to terms with the increasing competition in the industry, creating an organisational culture that promotes innovation2 and results in low attrition rates3 compared to the industry. In the past six years, Nokia has had two major waves of restructuring comprising three restructuring processes in all. The first wave came early in the 21st century, with two restructurings in 2002 and 2003 respectively. The second wave, currently in progress, aims to place Nokia at the vantage point with respect to the future technology. The late 1990's saw Nokia shifting its focus from 2G to software development. The growth path in 2G was limited primarily because of bandwidth constraint and lack of protocols for high speed downloads. Nokia had already begun work on 3G which would eventually see the convergence of telephony, computing and the Internet. Nokia's widespread restructuring at this time was an attempt to support this new corporate strategy. A monolithic organisational structure was no longer appropriate for a market that required flexibility and faster movement to tap opportunities. In 2002, Nokia split its mobile phone division pillar into nine separate business centres based on geography, charging them with working on specific markets independently, especially Russia, China and India. Nokia had finally learnt from its folly of neglecting these growth markets. September 2003 saw Nokia marching ahead with its structural changes by dividing the company into four divisions: mobile phones, multimedia phones, enterprise solutions and networks. 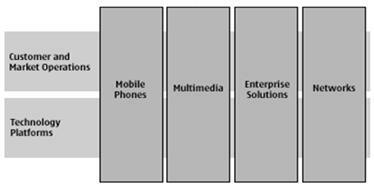 These divisions along with the cross-divisional market operations and technology platforms gave it a matrix structure4 attuned to the existing environment that needed flexibility (refer Exhibit 1: Nokia's Organisation Structure, 2003-2008). The divisions were small in size and enabled faster response in targeting markets that were vastly different with respect to feature demand and usage. This structure was significantly responsible for the growth that Nokia saw in this period, especially in the emerging markets. Nokia managed to overcome its mistake of allowing competitors like Motorola to run away with product innovations like flip phones. But Nokia's change-if-unfit methodology of dealing with its organisation structure ensured that the second wave of restructuring was not too far away. This led to cost ineffectiveness and called for a major revamp and re-structuring in Nokia. Nokia restructured itself into three main functional groups: Markets, Devices, and Software & Services (refer Figure 2: Global Architecture (New Structure), 2008). This division handles customer, front-end sales and the go-to-market strategy of Nokia sales worldwide. It deals with all the hardware and software requirements for the development of a new mobile phone. Research and Development, product development and software variants that were earlier separated in three divisions have now been put together under a single umbrella division. The R&D division was further broken down into functional entities as per the requirements. It was created in the restructuring exercise with an eye on the future of the industry. It reflects the path that Nokia wants to take in the coming years and is in sync with its vision of bringing the best of Internet to phones and offering Consumer Internet Services. Nokia established networks division in collaboration with Siemens as a separate entity to grow fixed and mobile network infrastructure and services. This helped Nokia to expand its scale of operations and strengthen its market position. How Does Nokia Do It? Organisations of the size of Nokia tend to stick to the same structure for long periods of time for the simple reason that it is an enormously difficult task to restructure. Large organisations that undergo restructuring face a lot of discontent from employees who have gotten used to a specific style of functioning (organisational inertia7 ). How then is Nokia, a giant, able to restructure so often without batting an eyelid? A large part of this answer stems from its organisational culture and values. "Willingness to change is a strength, even if it means plunging part of the company into total confusion for a while"
The need for a "Culture of mobility" has led to an external strategic focus and flexible environment. This flexibility has ensured that even major changes result in minimum discontent among employees. Transparency in the restructuring process and a clear definition of new roles and duties allow things to fall in place quickly ensuring a smooth transition from one structure to another. The structures adopted also have a role to play in the success of the restructuring exercise. The newer structures have allowed for significant growth through acquisitions and collaborations. The divisions' multifunctional competencies have resulted in increased cooperation with organisations in the wider ecosystem. Acquisitions of smaller technology firms are an attempt to use its divisions' expertise to grow. These acquisitions and other collaborations form a part of Nokia's extended firm. Symbian, Nokia's leading collaborative platform for mobile devices is one such component of its extended firm. Nokia, over the years, has evolved both organically and inorganically. It has always kept an eye on the future and worked towards achievement of its future goals. To support this corporate strategy, it has undergone three structuring changes in the past six years in order to adapt its business model and culture. This has helped Nokia to be a step ahead of its competitors. Nokia's entry into the mobile internet application development is important for its future growth. Nokia sees this as the next step to stay ahead of the competition. This would require one more structural change for Nokia to foray into a completely new field. Whether or not it succeeds will depend on how it is able to change itself from what it is now to what it should be to meet the demands of a new era. While the first two waves of restructuring had not greatly tested the ingrained culture of flexibility, commitment and innovation, the next wave will require a never seen before emphasis on these traits. Restructuring a giant organisation is not easy, and Nokia will have to do it all over again to maintain its competitive edge. Nokia - Story of Nokia, http://www.nokia.com/A4303001. Last accessed on May 12, 2009. Nokia - Research, http://www.nokia.com/A4946103. Last accessed on May 12, 2009. Thomas K. Thomas, 'Nokia plans to add 5,500 workers in India this year', The Hindu Business Line , Mar 30, 2008, http://www.thehindubusinessline.com/2008/03/30/stories/2008033050990300.htm. Last accessed on May 12, 2009. Richard L. Daft, 2007, Understanding the Theory and Design of Organizations , New Delhi: Thomson South-Western Publications, pp 208–213. 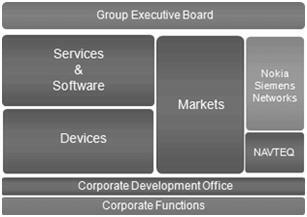 Nokia - Business Group Structure, http://web.nokiaasia.com/NOKIA_ASIA_2/About_Nokia/Company/Structure/business_group_structure2.jpg. Last accessed on May 12, 2009. Nokia - Structure, http://www.nokia.com/A4126325. Last accessed on May 12, 2009. Francesco, A.M. & B.A. Gold., 2005, International organizational behavior , 2nd ed., Upper Saddle River: Pearson Prentice Hall, pp 547.